I took the ferry to work today. It was raining. 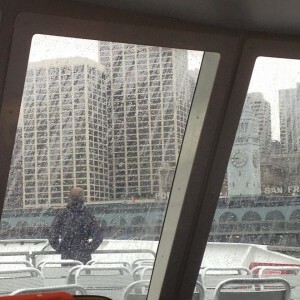 I snapped this photo as I wondered what this man was doing standing in the rain, on the ferry. I noticed how he seemed perfectly content standing there in the rain. Guess what? Someone replied with a story! Surrounded by so many yet really all alone in my thoughts… It’s a teetering balance between the seen and unseen. People pass by and quickly head indoors to the dry. They want to escape the damp drops falling steadily. For me, the rain washes away a bit of the pain and burdens that weigh me down like an albatross around my neck. The rain is a welcomed sight. The rain allows my tears to flow freely. To flow without having to explain. To flow without having to share the hurt I feel over this latest set back in what seems like a string of many over the past months. I lost my beloved dog. My faithful companion of more than 15 years. I’m not sure why I’m letting this hit me so hard. Most would say it’s just a dog, to get over it. But, Bentley was my dog. My buddy. He’s stuck by me in thick and thin. No one could have guessed when the dawn’s rays broke through the clouds yesterday that within hours we’d be saying good bye. How will I break the news to our son who’s away at college? Man, he loved that dog as much as anyone. Sure, we knew Bentley was starting to slow down but can you ever really be prepared? The rain continues to beat droplets into my face. I stare off at the passing buildings but don’t truly see them. The release of being free to let it all out is welcomed. In some ways it washes the heartache away. It’s preparing me for something new and very different in the days ahead. As the ferry chugs along I feel both drained, at peace, and refreshed. What an emotional ride this has been. It feels as if I aged years since yesterday and only hours have lapsed. My stop is nearing faster than I’m ready for once I step away from this rail the mask I wear must return. Once again resuming the face of a man who lost a dog and carries on like it doesn’t hurt as deeply as it does. It’s just a dog…but Bentley, if they only knew, was (and always will be) so much more to me. Rest in peace, buddy. You’ll be missed. ← Did the iPhone simplify or complicate my life? Thank you, Sally, for inspiring me to write freely and your generosity in sharing it publicly here. I really appreciate it. Thank you both so much for posting this. Although I did not even go to work that day, if that man on the ferry were a woman – he would have been me. I was glad to wake up on Friday morning and see that the day looked the way I felt. After having to put down my own best friend of over 15 years the night before, sunshine would have been some sort of betrayal. By the time I read your post, I had already been walking in the rain, and had already thanked it for helping me hide my tears, specifically for the reason Ruth saw in the man on the ferry. A kind acquaintance sent me your story, thinking it was apt if I was up to reading it. It was. It is. Perfectly. I have no children away at college I’m worried to give the sad news, but I have just realized that my perceived independence I’ve been so proud of between the ages of 19 and 35 – has not really been independence. A single day too late, I realized that I never actually was on my own. I always knew Guinness was my best friend, but I somehow didn’t comprehend that I was not alone. The silence in my apartment over the past couple of days makes it painfully clear that I am now. The universe seems too big for that, but maybe it’s not. With all the input from all over the world our brains take in every day…Sally likely snapped her picture at a time that I was walking along the very same Bay, staring blankly at the buildings without actually seeing them, watching the ferries go by, and being so glad for the rain for the same reasons as in Ruth’s story. Thank you, very much, for sharing this. It may not be comforting in the exact same way as a hug from a good friend – but it is incredibly comforting. Especially when those friends go home for the day. Heartfelt condolences on the passing of Guinness (great name, by the way). While Bentley is purely fictional he has some roots in how I felt when our cat (aka Kitty, we weren’t terribly original when it comes to names) passed six years ago and the two recent deaths of our two “nephew-dogs.” They all led long and full lives. We were adopted by Kitty thirteen years prior. Wow, those first days…and weeks were hardest for me. Kitty was my shadow around the house and in my home office. As bizarre as it feels to type this I actually felt and sensed his presence around me in those early days. Thank you from the bottom of my heart for sharing a bit about Guinness with us and letting us know how my writing piece touched you. It means a lot to me. It was on a whim that I responded to Sally’s photo and let the words out. Apparently these are words that needed to reach you at this moment in time from a writer on the other side of the nation. I’ll be thinking of you and joining you in remembering Guinness in the coming days. Know that the hurts do fade with time and then the good memories can fill the void, bloom, and take root in your heart. Thank you SO much for sharing your story. I am sorry for your loss of Guinness, the feelings are real. I lost my beloved Poncho 3 years ago and I still miss him every single day. Amazing you were walking along the Bay that day too! The world does work in mysterious ways. Sending you some virtual love during this challenging time. Thank you all for inspiring me with your thoughts and warmth.